This sign, Little Crossing is right inside the Casselman River Bridge State Park. This park is where the reincarnations, the living history interpreters, the re-enactors, those interested in this historical moment assembled. Go right to spot where this sign is — click on “Frontier Forts Google Maps.” Click on icon to see more info. General Braddock’s 4th camp on the march to Fort Duquesne June 17, 1755. Washington arrived here after Braddock’s defeat July 15th, 1755. See where this sign is — Click on “Frontier Forts Google Maps.” Click on icon once map appears. General Braddock’s 3rd camp on his march to Fort Duquesne June 16, 1755. The route, later known as the Old Braddock Road, passes to the southeast of the National Road. Captain Orme’s diary says “we entirely demolished three wagons and shattered several” descending Savage Mountain. It was on 14 June that GW wrote to his brother Jack from Martin’s plantation near Georges Creek, but the army did not begin its march from that camp until the next morning. – Founders Online footnote. Here is Source of picture and more info on Dr James Fever Powder. General Braddock’s 2nd camp on the march to Fort Duquesne June 14th, 15th, 1755. The old Braddock Road passed to the southeast of the National Road from Clarysville to the “Shades of Death” near “Two Mile Run.” The National Road was begun by the Government in 1811. Where is Martin’s Plantation really? This book presents significant and harmonious evidence that Braddock did not turn southwest at the confluence of Porter Run and Braddock Run, but instead followed the existing Ohio Company Road through an area later known as Eckhart Mines. This theory continues, drawn from the same sources, that Martin’s Plantation was located west of George’s Creek, not to the east of the drainage as previous authors have surmised. As they crossed this formidable mountain about a mile south of here, Braddock’s aide, Captain Robert Orme, recorded the difficulties. “Its descent is very rugged and almost perpendicular; in passing which we entirely demolished three wagons and shattered several.” After Orme listed the passage of 2100 soldiers, 30 wagons, 400 horses, siege artillery and tons of supplies, General Braddock took a young George Washington’s advice. He soon created a “flying column,” shedding most of the cumbersome equipment and moving more quickly to his objective. By Christopher Busta-Peck, September 22, 2007 2. Marker atop Savage Mountain A former service station, built to serve motorists of another era, sits in the background. and his colleagues rest near the summit of Big Savage Mountain. The old twelve-footwide road is clearly visible between them. Marker series. This marker is included in the Braddock’s Road and Maj. Gen. Edward Braddock, and the The Historic National Roadmarker series. Location. Marker is missing. It was located near 39° 40.465′ N, 78° 57.739′ W. Marker was in Frostburg, Maryland, in Allegany County. Marker was on Historic National Road (Alternate U.S. 40), on the left when traveling west. Touch for map. 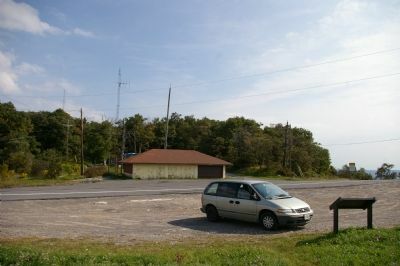 Marker was in this post office area: Frostburg MD 21532, United States of America. This is actually a handy starting point of a site. However, there are corrections needed. Captain Horatio Gate’s New York Company. See more Horatio’s Gate’s Travelers Rest place near Charles Town WV. (each approx 3 officers and 50 sergeants, corporals, drummers and soldiers). A company of Maryland Rangers commanded by Captain Dagworthy. Edward Brice Dobson (son of Governor Brice Dobson). <— incorrect, Dobson should be Dobbs.